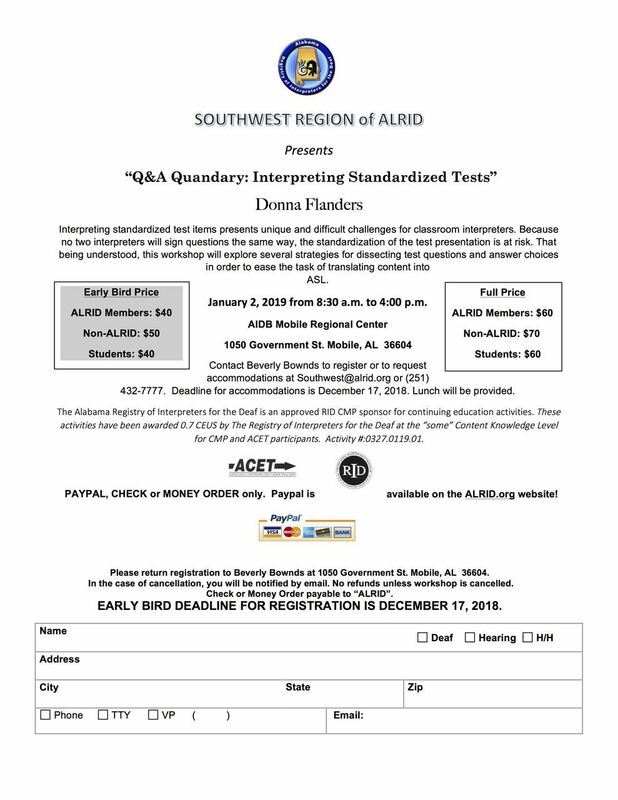 Alabama Registry of Interpreters for the Deaf - "Q&A Quandary: Interpreting Standardized Tests"
"Q&A Quandary: Interpreting Standardized Tests"
Non-members of ALRID registering on/before December 27, 2018. Students registering for the workshop on/before December 17, 2018. Students registering for the workshop on/after December 18, 2018. Interpreting standardized test items presents unique and difficult challenges for classroom interpreters. Because no two interpreters will sign the questions the same way, the standardization of the test presentation is at risk. That being understood, this workshop will explore several strategies for dissecting test questions and answer choices in order to ease the task of translating content into ASL. Register online or by mailing the registration form to Beverly Bownds by December 17th and save $20! Lunch is provided. Deadline for accommodations is December 17, 2018. See the registration form for more details (including the cancellation/refund policy).